Amy McHodges - A Salute to All Thoughts, But Mostly Mine: Pirates of the Caribbean ~ On Stranger Tides ~ with a Giveaway! 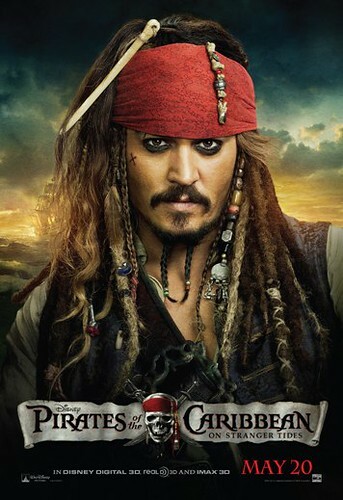 Pirates of the Caribbean ~ On Stranger Tides ~ with a Giveaway! I don't do a lot of giveaways but I have so many friends who LOVE the Pirates movies that I couldn't pass this one up. The prizes are an adult "On Stranger Tides" T-shirt (size s-m-l or xl), a black bandanna and two temporary tattoos. Entry is going to be EASY. To enter this giveaway, add one comment below in "pirate speak." Throw in a few Arrrghs and Mateys and you are entered once in the giveaway. The winner will be announced here, on the blog, on Tuesday May 17th at noon. You want to enter more than once? Here's how, follow this blog either by email subscription, RSS feed or Google Friend Connect, leave another comment telling me that you are following. One more entry can be had by following me on Twitter @amymchodges, and be sure to leave a comment here. Oh, and these extra entries have to be in "pirate speak" too! Have fun and good luck! I want to sing and dance, I want to sing and dance. I want to be a pirate in the Pirates of Penzance. Wear me silver-buckled slippers and me tight shiny pants. I want to sing and dance.